1. Substantial (but not necessarily majority) support from all sections of the party: the parliamentary party (other Labour MPs know the qualities and weaknesses of the candidates better than anyone else), constituency members, trade unions and their members, affiliated members and supporters. 2. Experience in government or front bench opposition: of sitting in Cabinet, as a minister in charge of a government department, chairing or sitting on committees, working in a shadow cabinet. 3. Experience of managing and leading groups in politics, government, industry, etc. : evidence of ability to work with others, to compromise to get things done, apply core principles to changing circumstances, conciliate opposing factions, work within financial and other practical constraints. Experience of work and interests outside politics. 4. Intellectual ability: a sound educational record in serious subjects in school and higher education. 5. Charisma and gravitas. Manifestly serious, likeable, reasonable, undogmatic, authoritative and pragmatic on television. A good listener. 6. Reforming zeal: ability to look beyond technocratic fixes to the big picture in specifically Labour terms (protection and empowerment of the weakest and most vulnerable, a major role for the state in support of the individual, equality of outcomes as well as opportunity; liberty, solidarity, fraternity). Constructive, practical proposals for post-devolution constitutional reform, including future durable relationships of England and Scotland with the UK as a whole. 7. A passion for social justice, fairness, willingness to take risks in order to protect individual freedoms, commitment to human rights and the rule of law. Specific proposals for reform of prisons and penal policy, including of illiberal anti-terrorism legislation. 8. Sound judgement of people and groups: a record of association with colleagues and allies with similar values, ability to recruit reliable people, not charlatans or those with dubious past records, choosy about which movements and campaigns to support (especially no record of association with movements or individuals that condone terrorism, illiberal policies, denial of basic rights, undemocratic régimes or opposition to the Labour party). 9. A working understanding of basic economics and a willingness to listen to and learn from trained economists. 10. International outlook: high priority for the Atlantic alliance (regardless of who’s in the White House), an active and constructive role in the EU, the UN, the Commonwealth and NATO; a strong commitment to the UN Charter as the principal instrument of international law; a willingness to commit the UK to using force in international affairs when no alternative is available, the action is legal under the Charter, there is substantial international and domestic support (especially from the EU and the US), a good chance of success for defined objectives, and where ultimate benefits clearly exceed human and material costs. Not a pacifist. 11. A proven record of ability to translate generalities and motherhood statements into practical and achievable measures. 12. Ability to recognise that winning general elections is an absolute pre-condition for achieving any of Labour’s historic purposes, and that winning elections must take precedence over ideological purity and wishful thinking: the best is sometimes the enemy of the good. Which candidate ticks which boxes is partly a matter of subjective opinion, but also partly of fact. I have compiled the list with no intention to advance or belittle the claims of any particular candidate (although it will be obvious that in practice the list effectively disqualifies one of them, and party members should clearly think long and hard before voting for any candidate who ticks only a small minority of the boxes, even if like me you agree with many of his policies). Voting closes at midday on Thursday 10 September 2015, with the results announced on Saturday 12 September. So if you still haven’t voted (and are entitled to), have a look at the twelve boxes before you do. It might change your mind. My own vote is of no general interest, but since you asked: having read the election literature and especially the revealing potted manifestos of the four candidates in the Fabian publication Leading Labour (pdf), I have voted 1. Yvette Cooper (notwithstanding her wretched record on item 7 above), 2. Andy Burnham, 3. Liz Kendall, although the third is probably redundant because Cooper and Burnham are extremely unlikely to be eliminated before Kendall. If, in spite of everything, you’re voting for Jeremy Corbyn, you probably don’t need to bother using your second, third or other preferences, since Corbyn is most unlikely to be eliminated except possibly in the last round, so his second preferences are extremely unlikely to be redistributed. Indeed, if the polls are to be believed, and taking into account the consequences of a totally asinine electoral system (for which no thanks, Ed), there’s a real possibility that Jeremy Corbyn will be elected on the first round by winning at least 50% + 1 of the votes cast. And I’m prepared to risk the prediction that the Labour party with Jeremy Corbyn as leader will never win a general election. I just hope we’ll never know. Do I want another careerist like Blair, a bloke who can go around the world speaking to some of the sickest tyrants just to make a pile of money for his so called faith Charity. Do I want Kendall who I suspect sees her self as a Blair rite drone and is backed by Progress . Cooper who is to the right not anywhere near the center and then Burnham who is what ever you need so long as you vote for him. No thanks because I do not think they can beat the Tories, the Tories are now back they have found a new life with a new leader and back ups in Corbyn and maybe May who I think would give labour the best chance and then Boris. But I doubt even Corbyn can get near to the Tories at this time but to be honest I’m sick and tired of New labour and the right wing drift of labour. I’ve a disability and after going through ATOS twice and winning twice and now I’ve bot to go through the dam PIP’s and when labour attacked the immigrants with Miliband all the rest because they thought the voters would want them that was it for me. So yes I will be voting for a left winger. Oh well, there goes Keir Hardie. Can’t have any of those common lefty troublemakers can we? What I like though, is all those unseated Scottish Labour ex-MPs and advisers saying Corbyn couldn’t win an election …. after losing all but one seat! On the Labour election process, it is worth reflecting that it was devised by the right-wing of the Labour Party as a means reducing Union influence and thereby consolidating right-wing control of the party. Much in the same way that the election system for the Scottish Parliament was designed to prevent an SNP majority. Personally, I find it quite heartening that the masses can find a way of subverting such stratagems …. Sorry when I said on my comment I did say Corbyn I meant to say Cameron, Osborne May and Boris all of them solid Tory people. Tom, thanks. On your second comment, I wouldn’t think much of the powers of reasoning of those who devised this ludicrous electoral system — including Ed Miliband, obviously, hardly a right-winger? — if as you suggest “it was devised by the right-wing of the Labour Party as a means [of] reducing Union influence and thereby consolidating right-wing control of the party.” It actually increases the influence on the election results of the trade union members by giving their votes equal weight to those of the Labour MPs and the members of the constituency parties, whereas under the (very sensible) previous arrangement union votes were severely devalued in relation to individual party members’ votes, and even more heavily discounted against those of Labour MPs. I suspect that the weighting was removed in the current system purely with the harebrained intention of making the whole thing “more democratic”, without the slightest effort to work out what the dire consequences would be. Well, they ken the noo. A commitment to apologise for (I would prefer to say denounce) the Labour leadership’s and Labour Party’s part in the shameful lies and political manipulations over the Iraq invasion. I doubt if any of these candidates can win in 2020. However, JC has reached out to a disenfranchised bloc of society that hates (or is just bored by) the politics of the last 40 years. I don’t know how far this new movement can go. Maybe it can wash out the Augean stables left by Blair, Straw, Mandelson etc. Maybe not, but I sure would like to help it try. The more I hear the old has-beens bleating in the Press, the more I am convinced that nobody but Corbyn will do. Brian writes: Thank you for this, Robin. Like you, I would like Britain to give up Trident (and nuclear weapons), and to return the railways to public ownership. I think Mr Corbyn’s undertaking to have the Labour party ‘apologise’ for the Iraq war is ridiculous, for the reasons set out below. But even if I agreed with all three of your points and not just two of them, (a) I don’t believe a Labour party led by Jeremy Corbyn could ever win an election, so neither of the first two desirable objectives could ever be accomplished as long as JC is leader of the party, whereas both might be possible under a different, electable leader; and (b) support for several of Corbyn’s policy objectives — including especially his rejection of ‘austerity’ cuts and budget deficit fetishism in favour of growth and equitably distributed prosperity, including borrowing (but not using QE) for investment — is heavily outweighed by the numerous objections to the election of Corbyn as Labour leader, not only because of strenuous objections to several of his other policies, but also because he possesses hardly any of the qualifications listed in my post as either essential or highly desirable for an effective leader of the Labour party, leader of the opposition or aspiring prime minister. Mr C’s proposal to apologise for Iraq on behalf of the Labour Party seems to me fatuous. The Labour party didn’t take Britain to war with Iraq: a Labour government did, which is obviously a completely different matter. An apology issued by a person or body which has no responsibility whatever for the action apologised for is meaningless, and indeed presumptuous. A huge number of Labour party members at the time, probably a majority, were passionately opposed to the war. As one of them myself, I would be appalled by an apology issued by the leader of my party for something my party didn’t do. The Labour government that was responsible for involving Britain in the war can’t apologise for having done so for the obvious reason that it no longer exists. The leaders of that government who bore the main responsibility for the decision to join in the aggression against Iraq and the illegal occupation of that country are the only people in Britain who could plausibly be called on to apologise for it, but they have all refused to do so and all continue to defend their actions, so demanding their apologies is a complete waste of time. Robin, you seek to make Corbyn’s proposal marginally more defensible by substituting “denounce” for “apologise for”, which is a pretty fundamental change!, but that won’t wash, either, because Ed Miliband, in his first speech as Labour party leader within minutes of being elected already did it (“I do believe that we were wrong. Wrong to take Britain to war and we need to be honest about that. Wrong because that war was not a last resort, because we did not build sufficient alliances and because we undermined the United Nations” [28 September 2010]). How often do successive Labour leaders need to go on doing it? Solemnly repeating what has already been emphatically said by a leader of the party, and what has nopw become a trite truism, is just a cheap gesture. Some, but not all, of the things Mr Corbyn wants to do are good and sensible. A few might possibly win widespread popular support in the electorate at large. Others would strike a majority of ordinary voters as crazy and even alarming — leaving NATO and abolishing the monarchy, for example, to name but two: sadly, giving up our nuclear weapons is probably a third. And an even bigger majority will, I’m sorry to say, regard the idea of Jeremy Corbyn entering No. 10 as prime minister as laughable, regardless of his policies. 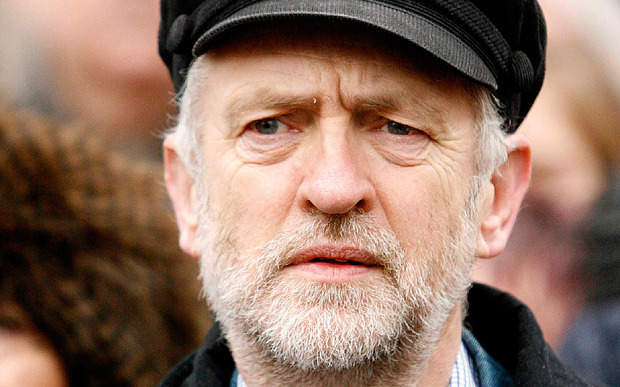 If we’re ever to get rid of Trident it will have to be under the leadership of someone other than Mr Corbyn. Finally, I need to be convinced of the propriety of registering as a supporter of a political party and declaring one’s acceptance of its values purely (or im-) in order to vote for a particular candidate for its leadership. I don’t and can’t condemn it. But it makes me uneasy. Nevertheless, welcome back, if only half way! Locking horns with you, Brian, is always like running two marathons on two successive days, so I’m not sure I can keep this up – but here goes. I don’t see much point in arguing about “apologies”: I have always thought this post-modern habit of apologising for everything from the slave trade to the Anglo-Saxon invasions is wholly ridiculous – but I do think that an expression of regret – and indeed shame – for something that was done in our name in our time by people we elected is in order, and it will bear any number of repetitions until all the guilty parties either themselves don sackcloth and ashes or die or are deselected. I don’t think any of the candidates can win in 2020, and I see no point in trying to guess at 2025, so the concept of choosing the person most likely to win a general election seems to me pointless, even if I were prepared, as I’m not, to endorse the continuation of the old, boring, corrupt, unprincipled, locked-in-a-bubble politics of the last 40+ years. 1. It seems clear that Corbyn has the support of all the groups you mention, save the Parliamentary Party, which is totally out of step with everyone else. Your suggestion that the P.P. has better insight into character than anyone else is pretty naive: the P.P. is largely composed of tired cynics who are committed to policies and attitudes that have failed and which they can’t bring themselves to abandon. Many of them, starting with anyone who refuses to sit on Corbyn’s front bench, should be deselected by their constituents. 2 & 3 Mostly disagreed, except for the last sentence, which none of the “mainstream” candidates can meet – one of the principal terrible failings of the old politics and why its practitioners are so despised. 4. Not sure what school and HE have to do with it. Ernie Bevin? Nye Bevan? 5 & 6 Mostly O.K. But I’m not clear that any of the candidates have covered themselves in glory over constitutional arrangements. If any of them can help with the Party car crash in Scotland, it’s surely Corbyn. 7 & 9. No problem, but the devil in the detail…. 8. A para that belies your claim to objectivity, since it seems clearly intended to exclude Corbyn. Peculiar that he is the only candidate (or person) who is not allowed to talk to “terrorists” while everybody else does. 10. Minor disagreements, but let’s not go there again. However the penultimate clause is incapable of realisation. 11. I doubt if any candidate ticks this box. 12. Disagreed. The only hope for the survival of anything that one could without irony describe as democracy in this country, is that first the whole rotten political system must be shaken to near-destruction. The Scots have started it, and just maybe Corbyn can give the wagon another nudge downhill before the wheels finally come off. That’s why I’m voting for him. What exactly do you mean by this, Brian? Unfortunately the Economics profession, as a whole, doesn’t operate according to the scientific method. So, if supposedly worthy economists set up the rules of the eurozone, (like all deficits should be less than 3% of GDP, all debts should be less than 60% etc etc) and proclaim that it should work, then to them is does work. If it doesn’t then its because recalcitrant countries like Greece and Spain aren’t obeying those rules. Of course there are other economists, like Prof Steve Keen, who have a more intelligent approach. If someone says something silly -like Ms Kendall’s “we shouldn’t print money we haven’t got” they will gently point out that all money has, at some stage or another been printed or created in a computer, and before it was created it was “got” by no-one at all. Do you mean people like the geniuses (not) who advocate austerity economics or those like Steve Keen, and others, who know why it doesn’t work? 2. Despise patriotism, physical courage and British culture . 3. Venerate the USSR and all thing foreign. 4. Lack the common sense and decency of the average Briton. 5. Have a highly developed totalitarian streak. While the average British foreman and self employed craftsmen, often with connection to the Armed Forces, despises the middle class metropolitan labour supporter who largely lives on the sate in some form , then the Labour Party can no longer claim to represent the working man. The most vehement criticism of G Brown I have heard comes from J Beharry VC. When an NCO , born in the Caribbean who wins a VC criticises a Labour PM for the way the Army is treated; then the Labour Party has a massive problem connecting with the British people. Tories can be quite complimentary about Labour leaders, but it tends to be after their death. Bevin (of “Tories are vermin” renown) was public enemy #1 as far as the right wing establishment was concerned after the war. George Orwell seems to have acquired the status of the ‘darling’ of the right too. On both sides of the Atlantic. He’s often quoted approvingly as you’ve done. Yet, he was a left wing intellectual too. He fought with the Trotskyist POUM, Partido Obrero de Unificación Marxista, in the Spanish Civil War. He would probably be denounced as a Trotskyite entrist in the present day Labour Party! I think it was Bevan who said ” Tories are scum “. When considering who was the best Foreign Secretary since WW2, many say it was Bevin and for Defence , it was D Healey. Orwell fought with Anarchists and was critical of most middle class left wing intelligentsia. I cannot recall anything Orwell has written which gives credence to support of Trotkyists. Orwell mostly supported practical engineers, scientists and craftsmen. Orwell was very critical of the left wing intelligentsia for criticising the armed forces , opposing conscription and increases in defence spending pre- 1939 and then not fighting in WW2. If one reads Orwell’s writings from 1920 to 1950 one perceives a change of opinion. Animal Farm and 1984 were results of Orwells realisation that a totalitarian tendency was a major aspect of the left wing middle class intelligentsia character. A good list. Would that Mr. Blair met more of those characteristics and qualities. Does that rule out graduates in economics, politics and law? According to Freakonomics, economic experts are more likely to make accurate forecasts about specific questions than a control group of undergraduates, but they still get it wrong more often than not. FWIW this is on all fours with my own experience since I took up serious investment about five years ago. When I was watching the box yesterday it struck me that Mr Corbyn is in some ways like Nelson Mandela: generally polite, not addicted to bad-mouthing, one of nature’s gentlemen, someone it’d be a privilege and a pleasure to entertain in one’s home or share a pub lunch with. There are lots of politicians you couldn’t say that about. Apparently some meddling, harebrained idiot was trying to make things more democratic. Lord Mandelson, Lord Kinnock, Mr Blair and Mr Brown all did their bit to help Mr Corbyn on his way. Mr Brown more or less admitted the truth: that New Labour is just a pale imitation of the Tories. I would say the same about other three, particularly after what’s happened in Scotland. How do you suppose the Poet of the People would have voted? On a point of information: That’s not correct. He did not fight with the CNT–FAI except in the sense that they were both on the Republican side. It would be just as true to say he fought with the Communists. As I’ve said previously, he fought with the Workers’ Party of Marxist Unification (POUM). They were denounced as “social-fascists” by the Communists as was every Trotskyite or semi-Trotskyite grouping at the time. They were violently purged from the front lines by the Communists which seems odd, to say the least, as their fighting record against the real fascists was exemplary. We need to understand all that (just read Orwell’s Homage to Catalonia) to better appreciate his later writings. It was 59.5% as it turned out. So whether anyone likes it, or not, Jeremy Corbyn has won an overwhelming victory. It seems somewhat churlish for anyone to blame Ed Miliband. The electoral system as it operated was discussed at length over a year ago. It was supported overwhelmingly by all sections of the party, except, ironically, the left who weren’t happy about the loss of TU influence. Looking at the figures, it seems the only way the result could possibly have been any different would have been to restrict voting to sitting MPs only. Is that what anyone really wants? Jeremy Corbyn is now the democratically elected leader of the Party with a clear mandate. I’d hope everyone can accept that and work for win over the Tories in 2020 . But, if they can’t they need to quit the Labour Party right now. As it is Mr Hunt, Ms Cooper and Co are just making themselves look like bad losers. It would be better for the country, for Labour and for themselves if they were to resign from the party and Parliament forthwith. Or, if they want to continue their careers in politics, cross the floor and join the Tories; if they can’t stomach that they could try the Libdems or Ukip. When I was talking with my son about all this he remarked that when politicians try to do something dramatic they routinely overestimate its likely positive effect while they underestimate its unintended consequences. Brian writes: I very much hope that Labour under Mr Corbyn’s leadership will not be characterised by this kind of intolerant abuse of decent long-standing Labour party members and supporters who believe, with a good deal of evidence to back them up, that the election of Mr Corbyn is a disaster for the Labour Party and for those whose future prosperity depends on the election of a Labour or Labour-led government. I am so unaccustomed to finding myself on the majority (and winning!) side in a political argument that I can’t resist a moment’s gloating. Corbyn was dismissed by the know-alls firstly on the ground that he appealed only to Trots, entryists and other undesirables, secondly because his vote would be inflated by sneaky Tories etc., thirdly because the supporters signing up on the three quid ticket were all teenagers who understood nothing of real politics, and fourthly because the new electoral system was absurd, and bound to produce a “wrong” result. Well now, as an 82-year old non-Trot, non-Tory, non-teenager who was going to vote for Corbyn if only the creaky old Labour Party machine could actually have delivered a voting facility to me instead of repeated unkept promises, I note that it appears that every section of the Party, except its miserable MPs, is united in electing Corbyn. I don’t agree with everything Corbyn has ever said (nor with everything ever said by any or every other Labour leader) but I am clear that his attitude to the Westminster circus, if he can only maintain it, is shared by every thinking adult in the UK; that his desire for a non-nuclear Britain, for public ownership of the railways, and for an end to PFI in the Health Service, are all electorally sensible views to which the public can be converted, if it isn’t already; that the Tory-inspired public hostility to welfare is close to having run its course; that Corbyn’s attitude to refugees is catching a public mood; that his hatred of contempt for the poor and 0f the grotesque inequalities of 21st century Britain represent a return to the more tolerant, kinder, more empathetic country that I grew up in, and which we have allowed ourselves to be bullied out of, to our great shame. Corbyn above all stands for the essential decencies of British public life, which are wholly unknown to the Mandelsons, the Blairs, the Camerons, the Osbornes; if these things, and some of the policies that spring from them, can’t be sold to the electorate in 2020, then at least we can spend the next ten years standing up for them. And I hope that each and every person refusing to serve on corbyn’s front bench will be swiftly disciplined – preferably deselected – by their local Party. It seems to me that Corbyn is unlikely to win in 2020, but wholly certain that neither would A. Burnham or L. Kendall or even Y. Cooper. So let us at least use these years to re-express the values that Labour used to stand for, and to fight for these values – without the help of focus groups, or triangulations. Sooner or later Labour will retune to power: I only pray it will be with policies that are derived from those values and not on the basis that any old re-jigged Tory nostrums will do so long as we are in power. It is time that we re-learned the difference between right-wing and left-wing politics: for the left power is the means to an end; for the right it is an end in itself. This is why left-wing politics is a struggle. Time to re-learn and restate our purposes. “I am so unaccustomed to finding myself on the majority (and winning!) side in a political argument that I can’t resist a moment’s gloating. Brian writes: I should perhaps make it clear that, contrary to the impression given, the first sentence above, prefaced by quotation marks which are closed only after the writer’s endorsement of it, is not a quotation from my post (above) on which this is supposed to be a comment. The “intolerant abuse of decent long-standing Labour party members and supporters” !! Where have you been for the last three months? It seems to me that most of the abuse has been directed by the Labour and media establishment at Corbyn and his supporters – ‘morons’, ‘brainless’ etc. . Jeremy Corbyn also has a longer standing in the Labour Party, and for many, a more honourable record than most of his detractors. ” a good deal of evidence to back them up, that the election of Mr Corbyn is a disaster for the Labour Party ” What evidence? It seems to me that Corbyn has re-energised the Labour Party – hundreds of thousands voting. People seeing them as offering a distinct alternative. 15,500 new members have joined in the last 24 hours. Even Frank Field has said he nominated Corbyn to open up a debate in the party, but that unfortunately three of them had nothing to say! None of us can know what will happen in the 2020 election after the EU and probably another Scottish referendum, but in the meantime we can at least look forward to an opposition that doesn’t abstain on Tory welfare policy and campaigns for an alternative to the neo-liberal austerity consensus. My guess is that without Corbyn any (or all) of the other three faceless options would have led Labour into the kind of oblivion they had already achieved in Scotland. The question now is will the disgruntled anti-Corbyn MPs achieve that same effect by following the recent fratricidal tradition Brown /Blair, Ed/David? That hasn’t helped them in the past. Me too – it certainly makes a change! I’m very sorry, I should have made it clear that my quote was from Robin Fairlie, and I too an sorely tempted to gloat. We should work for party unity. So no gloating please! But we do need to ask everyone who has used phrases along the lines that Jeremy Corbyn would be a ‘diasaster’ , ‘unelectable’, ‘split the party’ etc to reflect on what they’ve said. The Tories will have carefully logged all these comments for later use. They’ll want to know how anyone can advocate anyone votes Labour when they’ve described the new leader in these terms. Can we have prompt retractions, please? It was just something said in the heat of the campaign. Right? Of course you’re absolutely right. I only said I was sorely tempted, but I’ll do my best not to crow about this very welcome – to many of us – result. It suddenly struck me that the highest majority I saw predicted for Mr Corbyn was 51%. The actual figure was over 59%, an error of about 15%. Pretty dismal. Even worse than their general election prediction? The fight for labour is to remove the Tories and pray that Progress does not act up, acting up is progress voting with and backing it’s real home the Tory party. I notice today Progress are calling themselves the moderates , a new name for from the right wingers Moderates makes me smile. . I think I know the real name, but it would get the post removed. I think the polls did OK. There were only two and wasn’t the second one 53%? The voting cohort at just a few percent of the the usual electorate wasn’t that easy to locate. The pollsters couldn’t just stop people on the street or work through the electoral register. So it was quite possible they could have been wildly out and that they didn’t even get the result right. It just felt to most of us that Jeremy Corbyn was going to win. His rallies were much better attended. Most of the people I knew were going to vote for him too so the result was no surprise. I remember thinking, right at the start, when there was such a lot of effort by the grassroots to get him onto the ballot, he might even win and that I really should have a few ££ on him. The odds were 150 -1 at the time at my local bookies. Silly me didn’t do it! “As it is Mr Hunt, Ms Cooper and Co etc etc.” (Me) Abject apologies to Ms Cooper, I got it all wrong – she’s apparently decided to play ball. I just came across an old story about Yvette Cooper demanding that Burnham and Kendal and should step aside to allow her to defeat Corbyn! Andy Burnham was making a similar call, I seem to remember, but Kendall thought it was sexist to demand two women step aside! How totally out of touch they all seem now. They were squabbling among themselves when they should have been on the hustings talking policy-policy-policy! Brian writes: There are two things that strike me as 100 per cent wrong with your comment, Peter Martin. First, you seem to think that those of us who were and remain convinced that a Corbyn leadership would be a disaster for the party and for the country (and for the dispossessed in our society) had some kind of obligation to keep our opinions secret in the run-up to the election, in case Corbyn were to win, and the Tories then used our warnings to score points off Labour (implying that the Tories might not have noticed Mr Corbyn’s flaws and defects if we had not publicly mentioned them). Does it not occur to you that those of us holding this view had an absolute duty to the party to express it as widely as possible in the hope of helping to avert the disaster we foresee? To refrain from saying anything that might be used by our political adversaries against us would represent a vicious and counter-productive form of self-censorship, or, even worse, a surrender to a kind of bullying by those who don’t share our views. The effect of your prescription, if generally accepted, would be to silence all debate within the party in favour of the party line as defined by those with the loudest voices. A party run on such lines would not be the kind of organisation that democrats would want to belong to or to support. Your second point is if anything even more questionable. You call on those of us who had the temerity to warn against a Corbyn leadership, and who explained the basis for our warnings, to “retract” what we were saying, again for fear that our original comments might be exploited by the party’s opponents — as if “retracting them” would prevent that happening! What would you think of anyone who had expressed the view that Mr Corbyn, decent chap that he may well be and however useful his past role as licensed dissident and gadfly, possessed almost no qualifications for leadership of the Labour party and even fewer credentials to win an election and lead the nation as prime minister, and who then announced that they had been wrong about him all along and now recognised his outstanding suitabilty for both roles — just because of his success in winning a convincing majority in an inner-party election? Such a “retraction” of hitherto firmly held views would be not just be manifestly fraudulent: it would also be contemptible. To demand such a betrayal of principle by those with whom you disagree suggests a remarkably low view of the personal integrity of your party comrades. Needless to say, I do not retract a syllable of what I have written on this sorry subject: I stand by every word. Perhaps you might reconsider your ill-judged demand. Those of us with a low opinion of Mr Corbyn’s leadership qualities, and those of you who admire them, will need to learn to live with our profound disagreement and to try to minimise the damage that such disagreement is bound to inflict on the party, in the hope that the wounds can be healed at the end of the Corbyn era, however far-off or close that might turn out to be. It will be a poor start to that effort if one side instantly demands unconditional surrender of its views and principles by the other. I regard the election result as disastrous, but I wish the new duly elected leader the best of luck and every opportunity to make a success of his leadership. But respect and good wishes for the new party leader don’t and can’t involve a repudiation of one’s views. Brian writes: Robin, thank you once again for your typically thought-provoking, even provocative, contribution. I don’t begrudge you your rare opportunity to gloat. Indeed, I agree with a lot of what you say, although my reaction is skewed by my strong disagreement with much of what you have chosen not to say. When you have cherry-picked the progressive and sensible elements in the Corbyn orchard for deserved praise, you leave almost as much rotting and unsavoury fruit on the same tree discreetly unmentioned. But my cordial agreement with most of the things you do say comes to a juddering halt when in concluding you call for the ‘disciplining’, even including the de-selection by their local parties, of those members of the parliamentary Labour party who have refused to serve in Mr Corbyn’s shadow cabinet or who have indicated that they would decline any invitation to do so. If you were (not wholly improbably) an obvious choice by talent and experience for appointment as shadow Foreign and Commonwealth Secretary, and were invited by Mr Corbyn to accept that appointment on the understanding that you would be required to administer a foreign policy based on automatic anti-Americanism, hostility to the EU and NATO, leniency towards violence when committed by Hamas and Hezbollah (as previously by the IRA), and a difficulty in imagining any situation in which you would be prepared to advocate the commotment of British forces to military action — would you really accept the appointment on such a basis? Yet according to your comment, a refusal ought to cause you to be so severely ‘disciplined’ that it could very likely mean the ruin of your political career. If you really believe that Corbyn and his extremely few natural allies in the parliamentary party ought to run the party on such nakedly totalitarian lines, suppressing all dissent and argument on pain of political oblivion, I can only say that it’s not a party I could ever vote for again, still less belong to. Lenin would approve. I don’t. Some of the more brutal Corbynistas have been reviving the tawdry old idea of compulsory re-selection of Labour MPs, with the same mind-set as that implied by your proposal. If that’s what we must expect of the Corbyn regime, my worst fears will be vindicated, alas. If that enables me to say “I told you so,” and to gloat, I shall have no difficulty in resisting that temptation. Far from gloating, I shall grieve. Jeremy Corbyn was born into a middle class background, attended a prep and grammar school yet only achieved two grade E, A levels. Corbyn had the sort of education many parents and children could only dream of , yet he achieved abysmal results. Corbyn squandered opportunities, either through laziness or ignorance. Corbyn dropped out of a poly and then worked for a union as an official. If Corbyn wanted to experience working class life he could undertaken unskilled labour( especially farms as he comes from Shropshire ) , completed apprenticeships or trained as a technician. Corbyn could have worked hard at school , gone to a top university and then taught at a poor school in Islington. The problem is that in many inner city schools, the teachers lack the ability to teach to high enough standards in order for children to read STEM subjects at Oxbridge/Imperial. When Corbyn became an MP at 34 , he entered the top 10% of salaries. Corbyn has been an MP for 34 years. One aspect which the Labour has failed to address is how technological advances and changes in trade has influenced employment prospects for those on average and below average wages. Islington has had one of the worst education records of London boroughs and has had paedophiles work in childrens care homes. When Corbyn was informed of paedophiles at care homes, he did nothing. Labour MPs sent their children outside of Islington becaus the state schools in the borough were so bad. If Corbyn had wanted to improve the opportunities for working class children, he would have striven to improve the quality of schools in Islington, so that they have the academic ability, technical skills and attitude to compete in a more technologically evolved and competitive international job market. Corbyn has track record of squandering opportunities and being involved in politics which has done nothing to improve the lives of the poorest people in the borough of Islington. In fact Corbyn is typical of many middle class Labour supporters whose income depends upon claiming they want to improve the quality of the lives of the poor but do nothing. People like Corbyn, Milliband and Benn are often despised by craftsmen and foremen because of their affectations and their ineffectiveness. I do of course understand m what you are saying. No-one wants the Labour Party to be homogenous and sterile in the way some of the far left grouping have to be. But, I’d still ask the question of how we go on to win the 2020 election from here if the right of the party aren’t prepared to make some gestures of reconciliation. I could also ask if you even want to win in 2020? “Leadership qualities” are always subjective. I can understand why you think JC doesn’t possess them. “Leadership qualities” are normally associated with the personality types of a Winston Churchill, a Margaret Thatcher, or on our side a Harold Wilson or even a Tony Blair. In other words, stubborn uncompromising types who don’t accept the need for any give or take in general discussion with those they have chosen to lead. Well maybe it’s time for a different approach. The membership think so. So let’s try to get away from Jeremy Corbyn’s personal strengths and weaknesses and have a discussion about policy. Lets start discussing if and under what circumstances the railways, the Royal Mail, and the utilities should be renationalised. Let’s start trying to understand what you call “basic economics” and why growth has flatlined since the 2008 GFC. Is cutting spending and raising taxation going to do any good in restoring the country’s prosperity? What do we need from the EU renegotiations? There’s more than just the immigration question. There’s the ability of the UK government to spend money on regional development, and set regional tax levels, for example which is severely restricted by EU rules. Why aren’t we talking about those? These are the important questions. Jeremy Corbyn’s choice of attire is quite irrelevant by comparison. We do not know of Corbyn’s leadership because he has never experienced the act of leadership. Anyone who worked in a supervisory role in construction, manufacturing farming, fishing , mining, oil industry, utilities , Armed Forces ,retail etc , etc and been held responsible for delivering results has experience of their performance being judged. Corbyn et al have been full time politicians since the 1980s and have never had to be responsible for solving problems. In actual fact the young Corbyn became a vegetarian after working on a pig farm. Does him credit both ways. True. On the other hand, according to Wiki during the 2009 expenses scandal, Mr Corbyn was revealed to have claimed the lowest amount of expenses of any Member of Parliament. In 2010 he claimed the smallest amount of all 650 MPs. Mr Corbyn certainly has a mountain to climb, and he deserves all the support we can give him. But he’s unlikely to do any worse than some of his most eminent critics. I was just wondering how it was possible that a candidate who won the support of nearly 50% of the membership (or 60% if we add in the affiliates and supporters) had a such a low level of support from the PLP? Maybe 20 actual votes from them? What’s been going on in the selection processes for the last 20 years or so? Why is the PLP so unrepresentative of the wider party? Has central office been leaning on CLPs with a “no lefties” decree? Especially when it comes to selecting candidates for winnable seats? How do we re-address the balance? That’s going to have to happen. The only way is to have more democratic selection procedures. Sitting MPs are going to have to make their pitch for reselection like anyone else. I know that wont be a popular thing to say but the principle that all MPs should be subject to a democratic reselection process, freed from too much central office interference, is not at all unreasonable. I’d allow the party a certain number of ‘parachute drops’ (maybe 5% of total seats?) for their favoured candidates but no more than that – even if they might be on the left. I do not think Corbyn working at an abattoir for a short term is going to convince a ganger or foreman in the construction industry that he is a practical man. Corbyn represents an Islington constituency so there is little need for expenses. The problem for Labour and the LDs is that their members are largely concerned with issues which have low priorities for those on average salaries, especially those in the private sector. The Labour PLP may have actually have views closer to the average Briton than many members of the Labour Party. You misunderstand me Brian – I hope not deliberately. I have no objection at all to any MP who has actually been offered a seat in the Shadow Cabinet discussing with the leader of the opposition the circumstances in which he could/could not accept the offer. This is established practice in all parties. What I take total exception to – and so should you – is the attitude of those who, before any offer has been made, have the effrontery, and lack of respect for the leading candidate/Party leader to announce to the world their determination not to serve. Who the hell do such people think they are? The impression they give is that of a crowd of little boys complaining that a big bully (actually the Party) has taken away their ball and they are not coming out to play. I repeat that any MP with that sort of chutzpah, that sort of contempt for the decisions of the Party to which he/she is supposed to belong, should be deselected by his/her constituency. I am not a raving enthusiast for total re-selection of sitting MPs – there are serious arguments to be had on both sides – but there are some levels of self-important disloyalty which are not acceptable in any Party. There was, and is, no alternative candidate who could have won in 2020 – leave alone won on a platform acceptable to the majority of the Party. The Party has voted, not just for a person, but for the boulversement of the whole Parliament-wide consensus on economics – and ethics – which has persisted since Milton Friedman and the Chicago school, which was tested in Chile, and other dispensable parts of South America, played with by M Thatcher, and is now flowering under Osborne, with not a cheep of serious opposition from Labour. That boulversement is something worth fighting for, whoever is leading it. Robin, I’m sorry (really! ), but I’m not convinced. I don’t think your distinction between Labour MPs who made it clear before being invited to join Mr Corbyn’s shadow cabinet that they would not do so if they were, and those who waited to be invited (or waited until JC had been duly elected) before declining, is either valid or clear from your earlier comment. Indeed, members of the previous shadow cabinet whose disagreement with some of Corbyn’s basic policies and beliefs was absolutely fundamental had a manifest duty to both Corbyn and the party at large to make it clear that because of that disagreement, they would not be able to serve in his shadow cabinet if he were to win and if, having won, he were to ask them to continue as shadow cabinet members. To have concealed their positions of principle until JC had been elected and had asked them to serve in his shadow cabinet would have been unfair to Corbyn, whose preliminary planning for his shadow cabinet would have been based on important misconceptions, and above all would have deprived those voting in the leadership election of extremely important and relevant information affecting how they should vote, namely the fact that a number of key figures in the party leadership found some of Mr Corbyn’s policies and ideas so unacceptable that they would not feel able to serve under him in the event of his winning the election. You ask “Who the hell do such people think they are?” Well, they are mostly veteran Labout politicians with experience of working in a shadow cabinet or in some cases actual ministerial experience in government, enjoying far from negligible support among their fellow MPs and in the party nationally, men and women who have had the opportunity to watch Mr Corbyn’s performance in and out of parliament, sometimes for many years, and whose experience and status entitle them to the expectation that almost any future leader would want them on his or her team. To pretend otherwise, as you seem to think they should have done, would have been ludicrous “who, me?” hypocrisy. I regret that you persist in your call for those members of parliament whose behaviour you controversially (and in my view mistakenly) condemn to be deselected by their constituency parties, and thus in effect expelled from public life, a grotesquely disproportionate penalty, reeking of the Leninist concept of a tightly centrally disciplined party that refuses to tolerate dissidence of any kind. The idea of an MP as a puppet on a string jerked by a few mostly extreme activists in his or her local party, not just at election time but whenever the MP has failed to obey the activists’ instructions to the letter, is to my mind unconstitutional, likely to have disastrous effects on the quality of our MPs and ministers, and intrinsically obnoxious. No person with any independence of spirit and opinion or self-respect would even contemplate running for election to parliament in such circumstances. I remain surprised that you hold such a view. I reject your accusation that I seek to encourage or accelerate the collapse of the Corbyn project. It would be absurd and mendacious to pretend that I welcomed his election as leader or that his success has changed my opinion of his capacity for leading either the party, or the opposition, or the country. I’m genuinely delighted that he scored a real success in today’s PMQs by making the occasion more serious and less of a bear-pit than it has been for many years, although it was a pity that he didn’t attempt to follow up any of the prime minister’s replies so as to expose their flaws, and that his failure to do so (or decision not to try to do so) enabled Mr Cameron to appear to give comprehensive answers to each of JC@s six questions, and indeed to appear more serious, well informed and prime ministerial than he has ever previously appeared at PMQs. Still, Mr Corbyn did well, after a pretty dire first few days as leader in which he seems to have done his best to anger and alienate influential parts of the media and great swathes of public opinion, almost as if on purpose. Let’s hope he’ll be better advised from now on and that under his leadership the party will achieve the success of many of the worthy causes that JC espouses. If so, I’ll undeniably be surprised, but I’ll also be delighted. On the other hand, if his skewed attitude to the EU weakens the Labour party’s unconditional commitment to continued EU membership, even perhaps to the point at which the Europhobes win next year’s in/out referendum, I shall tear up my party card and never vote Labour again. What’s more, if Mr Corbyn invites me to accept a peerage and membership of his shadow cabinet, I shall reject both, with almost no hesitation. So there. Finally, I hope, without much confidence, that your expression of suspicion that I might have “deliberately” misunderstood your earlier comment was a slip of the pen, although the concept of a “deliberate misunderstanding” seems to me an oxymoron. Deliberate misrepresentation is of course another matter entirely, and I hope you do not suspect me of that. Of course, Brian, I acquit you of deliberate misunderstanding, and apologise if I implied otherwise. But, perhaps for the first time in our long acquaintance, I found your rebuttal of my main point weak. I continue to believe that a refusal to accept a shadow cabinet post that has not been offered is a contemptuous – and contemptible – piece of arrogance. It was, of course, an attempt to destabilise the Corbyn campaign; in all probability it had, deservedly, exactly the opposite effect – certainly on me, and, I suspect, on many others. The whole behaviour of the three unsuccessful candidates throughout the campaign was an illustration of their unfitness for office. Anyway, I will now await the outcome of events in the Party with interest. Brian writes: Peter, if the parliamentary party, which has the primary responsibility for determining the party’s policies, is to arrive at a coherent, broadly agreed body of doctrine and objectives, it’s the Corbynite left of the party, constituting less than 10 percent of the PLP, that will have to make the main “gestures of reconciliation” — or as I would put it less emotionally, of compromise. Of course the size of Mr Corbyn’s victory entitles him to a major say in policy formulation. Luckily, however, he comes to the leadership with almost no firm or specific policy commitments: he has put forward a number of ideas, ranging from the daft to the sensibly progressive, “for debate”, so compromise should not be unduly difficult to achieve. But if he has any hope of leading a broadly united party in parliament, he will need to trim some of his more fanciful ideas to enable the great majority on the Labour benches to unite behind them. I’m afraid that first impressions matter a great deal, and very large numbers of UK voters will have drawn unfortunate conclusions from Mr Corbyn’s sartorial appearance at public events in his new official capacity in his first few days as leader. Pulling out of promised interviews on the Marr and Today programmes also says something about his judgement. Luckily he did splendidly at PMQs today. He has a number of mountains to climb and we must all hope that he’ll reach the summits of all of them, with a little help from both his friends and his many party critics. By the way, deselection between elections would be a disaster for MPs’ independence of action and values, for the quality of our MPs and ministers, and for the vital principle that MPs are not mandated or controlled by small groups of fanatical activists in their local parties. I know Burke is sometimes misinterpreted, but what he explained to the electors of Bristol was basically spot on. OK. You think Jeremy Corbyn’s ideas range from ” daft to the sensibly progressive” and ” he will need to trim some of his more fanciful ideas”. I wouldn’t say leaving NATO was “daft” or a “fanciful idea” but I’m not convinced that it’s a good idea. Membership or otherwise isn’t a pressing priority. I think we could all agree to put that on the back burner for now. Nationalisation of the railways? Yes. We have widespread public support for that. Network Rail is already Nationalised so we could just collect up the franchises as they become free. There’s nothing daft or revolutionary about that. The pressing issues as I see them are getting our story straight on economic issues and on the question of EU membership. At one time the whole of the party was sensibly Keynesian. ALL labour politicians mocked Margaret Thatcher for comparing the National economy to a household budget. But, its just the left now who are making the argument that it isn’t at all like that and never will be. So how do we get a “compromise” on that? It either it is or it isn’t! The Labour Party should be capable of earning the respect of people who build, operate and maintain Britain through their labour: if they cannot, what is the point of the party? Perhaps the Labour party should rename itself the Party of Public Sector White Collar Employees, Arts Graduates and Welfare Claimants. Brian writes: I think this exchange has exhausted its usefulness, as you will probably agree, Robin. But I can’t resist a final observation about your use of “of course” (“refusal to accept a shadow cabinet post that has not been offered … was, of course, an attempt to destabilise the Corbyn campaign”): a splendid example of the use of “of course” to try to deter anyone from challenging the patently incorrect assertion to which it’s attached. Now time to move on. I have to plead guilty to being to being an arts graduate, a Champagne Socialist, a near-millionaire, a self-employed white-collar capitalist and a North London nerd. Twice in my lifetime I’ve lost my job and claimed welfare. I’ve also worked for about fifteen years in the public sector.